What The Heck Happened At The Olympic Trials Marathon? One made her first team, another barely made the team and a third said it was the hardest marathon of her life. And the crowd went wild. If you wanted to look up the highlights of the Olympic Trials Marathon women’s race, there’s basically a half marathon that separated Amy Cragg’s win in 2 hours, 28 minutes, 20 seconds from the rest. For the better part of the first half, a solid group of women, fluctuating between 14-20 runners, traded off the top-4 spots. Soaring temperatures caused a series of DNFs throughout the day, including Alana Hadley, but the blazing sun didn’t seem to affect the leaders of the women’s race during the second half (well, most of the second half): Shalane Flanagan and Amy Cragg, who wore matching Nike kits from head to toe. The swoosh duo started to break away around mile 14, and for the miles leading up to the final 5K, the big question mark seemed to be that third-place spot. 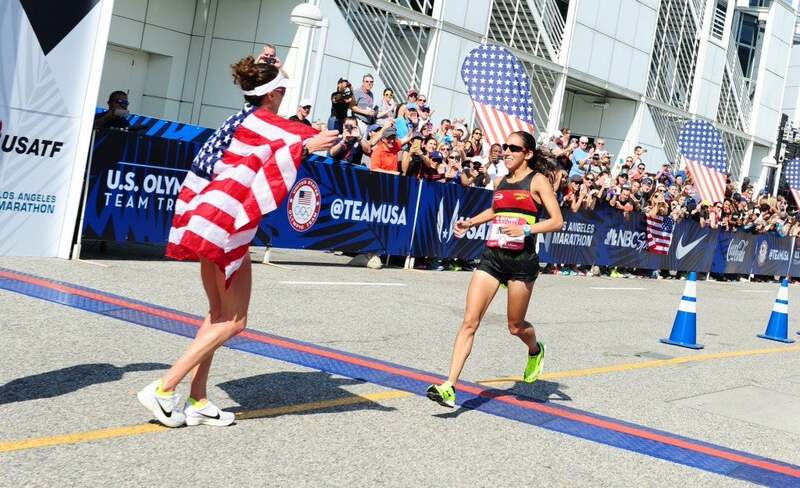 Desi Linden, Kellyn Taylor, Kara Goucher, Sara Hall and Janet Bawcom were all within spitting distance of the bronze at one point, picking off seconds between each other for what seemed like forever. 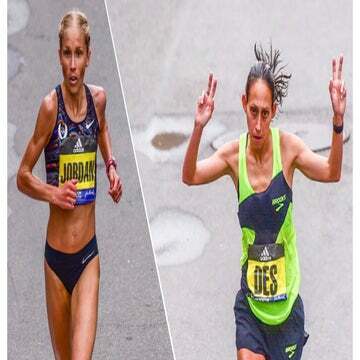 Slowly that scattered chase pack dwindled down to two standouts chasing down that final spot on the 2016 Olympic marathon team: Linden and Goucher. If you were watching at home, the crowds in Los Angeles also seemed to speak too soon about a 1-2 potential finish between Cragg and Flanagan. 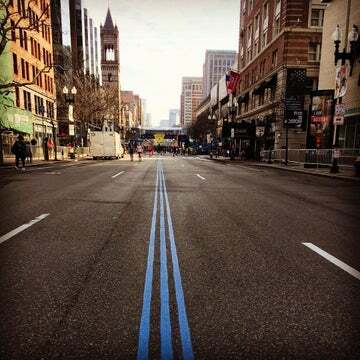 Both runners spent part of the final four miles talking to each other, and spectators buzzed with curiosity. What are they saying? Is Amy asking Shalane what to do? Is Shalane telling her to go for the win? It was clear someone was having the better day, and that someone was Cragg—the woman who missed the 2012 team by one place four years prior. Flanagan, the defending Olympic Trials champion, was falling apart. “I kind of looked at her and asked, ‘Hey, are you okay?’ And she said, ‘No I’m not.’ And she looked like she was struggling a bit just to say that.” Craig continued to encourage her teammate—one mile at a time—even as Flanagan struggled in the heat and doubted her ability to finish. In a pre-race press conference ahead of Saturday’s race, Flanagan had mentioned her unfamiliarity with running a marathon in this type of heat, something that was becoming more apparent. As the miles counted down to the final two of 26.2, Cragg took off with a kick reminiscent of a strong 10K on the track. No one was touching her at this point, and the question dramatically shifted from Who gets third? to Who the heck is getting second? At one point, Linden was running in third, right between Flanagan and Goucher, with a 40-second gap on either side. Within what seemed like the same amount of time, her trail behind Flanagan shrunk to 19 seconds. Linden steadily separated herself from a strong fourth-place Goucher, passing a slowing Linden in barely the final mile. The course, which covers a 6-mile loop four times for the greater part of the race, was lined with spectators. Linden’s moves and Flanagan’s efforts to hold on lit up LA’s downtown area with ear-piercing screams. As Cragg ran to a first-place finish and her first Olympic marathon team—she was also the second qualifier of the day behind third-place Jared Ward to pause after crossing the start area, thinking it was the finish line on the repeat-loop course—she threw her visor off her head and broke a tape she’s probably dreamt about for four years. Linden was 34 seconds behind, pumping her arms into the air as she came down the final 100 meters. 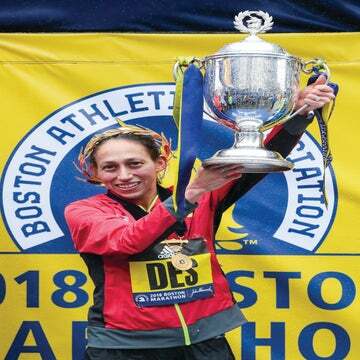 The roaring, stomping crowd happily obliged with ear-piercing cheers shrieking, “YEAH DESI!” Flanagan finished third, in 2:29:19, punching her fourth Olympic ticket and second in the marathon. 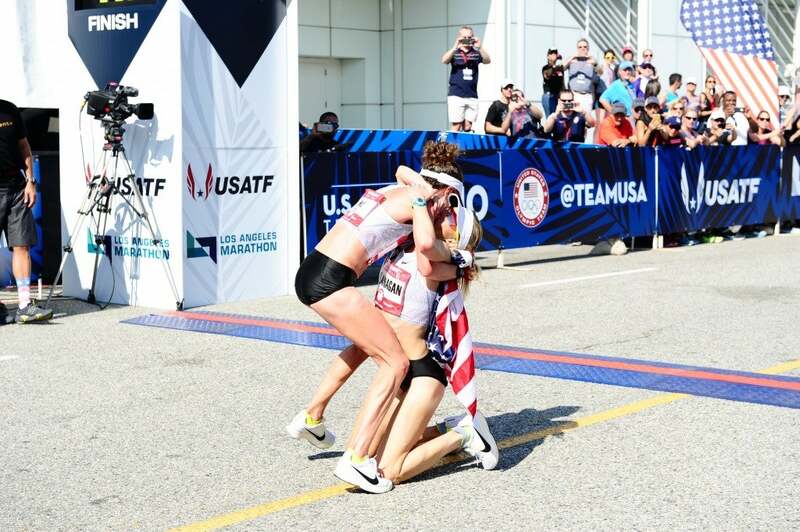 After visibly struggling over the final 5K, Flanagan collapsed upon crossing, as Amy hurried over to grab her teammate. Goucher finished fourth in 2:30:24, Janet Bawcom in fifth with 2:31:14 and Kellyn Taylor in sixth with 2:32:50. But the overall results really are that this trials was fast—the top-3 times were the sixth, seventh, eighth fastest in Olympic Trials history—hot and entertaining. Now the question is, Will an American step onto the podium in Rio? Congratulations to all who stepped up to that line on a hot, hot day in LA. We congratulate you!